Luke and Avery were awarded their Eagle Scout badges at the recent troop award ceremony. We're still very proud of them for this achievement. For Christmas this year, we drove down to Dallas, Texas to spend the holiday with my two sisters and their families. We love to get together with my sisters, but unfortunately don't get to do it nearly as often as we like since it's a 14 hour drive to see each other. We always have so much fun together, even in church. Although I'm sure the people around us would prefer it if we didn't have quite so much fun together. We end up spending a lot of time eating, but I guess that's what families do together. It was great seeing my niece, Mallory, and her family. Their kids are absolutely adorable and it was a joy to experience Christmas with them. Luke absolutely loves hanging around with his young cousins. We also got to spend time with my cousin, Terri, and her daughter Courtney. It's always great seeing them. My brother in law has a pretty good sense of humor. Notice the blue light strategically placed on Rudolph. Blue was pretty excited to be at my sister's. He kept asking us "What's a Texas?" when we told him where we were going before the trip. I think he was pretty happy when he discovered what it was. Sunny is an old pro at going to my sister's and he placed himself strategically next to the pool pretty much the entire trip. Any time someone threw a ball in the pool or anything he even suspected might be a ball, he diligently jumped in to rescue it. He's a good dog that way. Christmas morning was a lot of fun sharing presents with one another. We like to dress up like each other when opening presents. The kids were all pretty excited to start digging in. But Grandma Linda probably celebrated the most after she received some items she'd been wanting. We took a walk around the neighborhood after opening gifts. We're pretty sure that we'd seen this heron before in Minnesota so it was nice to see him again in Texas. At least he looked just like one we'd seen in Minnesota before. My niece, Bailey, is getting married in 2017 and we had a chance to go see her and her fiancee's new business. Justin just graduated from school and is a chiropractor. He bought a practice from a couple who were retiring and we were very impressed seeing what their new lives are going to look like in the future. It's a really nice place. My mom and sisters and I have been together for a long time. I'm glad we continue the tradition as often as we can. We went to the Dallas Zoo to see the animals and tried to act sillier than they do. It was fun to explore the different exhibits with Eli and see his reaction to the critters. 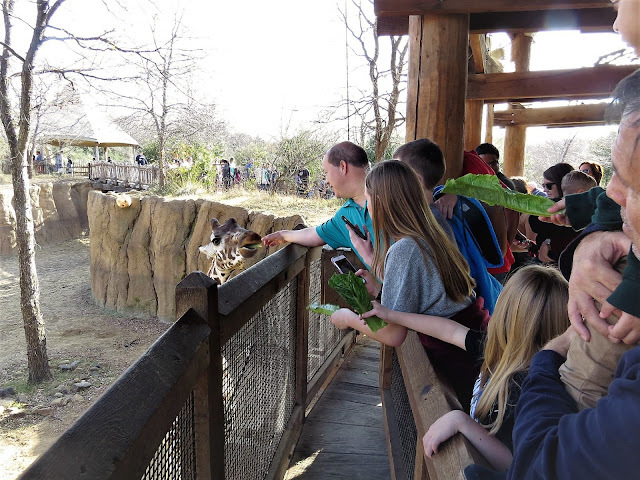 We loved feeding the giraffes. Those suckers got some pretty long tongues! We were pretty intimidated by the lion especially when he started roaring. He sounded like he was pretty hungry. This would have been a great picture had the dang window not been so dirty. 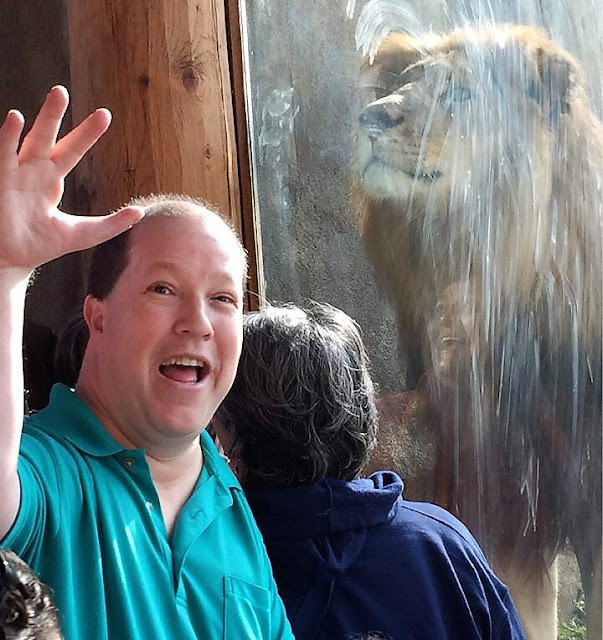 Look at the ladies reflection in the window and tell me she wasn't excited to see that lion. Avery focuses on getting selfies with the animals. The dang things just aren't very cooperative at posing for him, though. On our last day in Texas, we went to Fort Worth to visit the stock yards. Uncle Dave just had to go there and try some of the calf fries. Otherwise known as bull testicles. Several of us tried them and weren't very impressed. They kind of tasted like chicken, but the gravy that they served with them just made it all seem to be a very disturbing thing to be doing. Merry Christmas from the Swank Family!